The traditional production method - distillation - gives the highest quality gin, called Distilled Dry Gin. Safe as a faithful friend`s shoulder. Fill an old fashion with ice, to make it well cold. While the glass is cooled, insert a bar spoon into the mixing glass, cover it with ice completely. Then add Amaro, Vermouth, gin and stir it well with a bar spoon. Strain out the drink throughout strainer, to avoid wounds of mouth cavity by small ice shards(fine-strein). Garnish with a orange peel. Add all ingredients one by one. Strain it a little bit and garnish with cherry and lemon peel. If required add a dash bitter Angostura. Barristers in Great Britain are the high-caste lawyers. The word "barrister" derivates from the English word “bar”, it is the barrier that separates the judge from the defendant. This is the highest rank of lawyer in Britain. Since the XV century, the prisoners could instruct "an educated and eloquent friend" to protect their interests. The barristers had access to the "judicial bar", thus they could be heard by the court in the interests of their client. The barrister's speech in court is precise and sharp as a blade. They use to say in England about gin that it is “as cold as steel” - due to the strong cold aftertaste. When the name for the new brand was under discussion on Baker Street in London, the choice fell on “Barrister”, because it reflects best the meaning of the authentic gin AS COLD AS STEEL. Made by method stir and strain. Pour all ingredients into shaker and add ice. Well mix and pour ready-to-drink beverage into a glass throughout strainer. Garnish with lemon peel or slice of orange peel. Fill an old fashion with ice and put it aside. Pour gin, vermouth, liqueur and biters into glass. Add ice and stir it well during 20-30 seconds with a bar spoon. Free a glass from ice and pour into it a bevarsge throught strainer. Mix all ingredients in shaker with a lot of ice. Garnish with lemon twist or maraschino cherry. The 7th Moscow Bar Show (MBS) – the most long-expected event for the country's bartenders will be held for the third time in St. Petersburg on 4, 5 and 6 of September. Barrister Gin will be the active participant of the event. This year theme is Myth Busters. The MBS organizers have been rocking the Russian bar culture for 7 years destroying myths and misconceptions of bartenders and managers minds. MBS will refute the myths and misconceptions as the Russian and international bar industry. The main attractive zone for the guests is LADOGA two-sided stand. One side dedicates to the popular spirits for mixology. Here guests can test recognized by international professionals Barrister Dry and Old Tom* and also meet the new flavoured gins of Barrister brand. These gins are produced on the natural ingredients base: pink Barrister - strawberry for berry lovers; blue Barrister - orange and cardamom mix make this extremely color; orange Barrister - orange gin of 43 degrees is especially made for the cocktails with strong citrus note. In addition to the activities on the exhibition sight LADOGA will participate the night parties. At 8 pm on 5th of September the "Skotny Dvor" bar on Konnogvardeisky av. will host the Moscow bartenders Anton Korobov and Valentin Kosinov, who will launch a cocktail chaos with disco tunes by DJ Feodor Allright (leveldva music) together with La Escondida Mezcal, Roullet Cognac and Barrister Gin. * Barrister Gin is the winner of prestigious international tasting contests by Beverage Testing Institute (Chicago), The Global Gin Masters and The International Wine and Spirit Competition (IWSC). 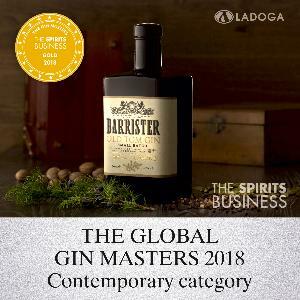 BARRISTER Gin, one of the three best-selling gins in Russia, won medals of at The Global Gin Masters 2018 in London. The brand took several medals at once in Contemporary gins category. Judges were looking for unique twists on the classic styles of gin that oﬀered a distinctive ﬂavor while also maintaining the key characteristic of the spirit. BARRISTER had to compete with famous world brands and did with confidence. BARRISTER OLD TOM Gin was awarded by a GOLD medal while BARRISTER DRY Gin took a silver medal in this category. The jury traditionally consisting of well-known mixologists, bar-managers, analysts and journalists made their decision during blind tastings only. Previously BARRISTER Gin already was recognized internationally. BARRISTER DRY gin has clinched 93 points, was awarded with a gold medal and titled as “Best Buy” according to the results of tasting by prestigious rating company Beverage Testing Institute (Chicago). Last year at The Global Gin Masters 2017 BARRISTER DRY gin won a silver medal and entered the top three gins in PREMIUM category. 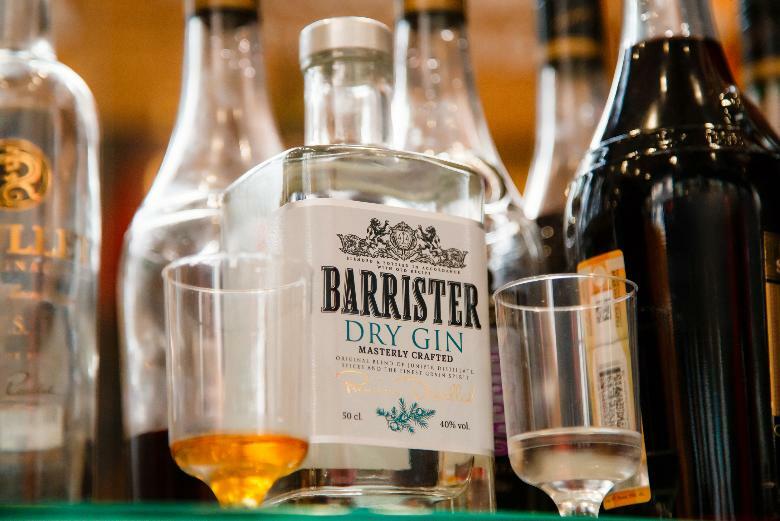 BARRISTER became the first Russian-made gin marked on the world gins map. In IWSR’s 2017 report for Russia Barrister Gin entered in top-three of Gin category with 13.5 thousands of 9-liter cases giving away only to global brands of the category. But Barrister showed the most impressive growth dynamics. The last two years have been particularly successful for Barrister on the world stage. Gin got The Global GIN Masters (UK) and Beverage Tasting Insitute (USA) awards.